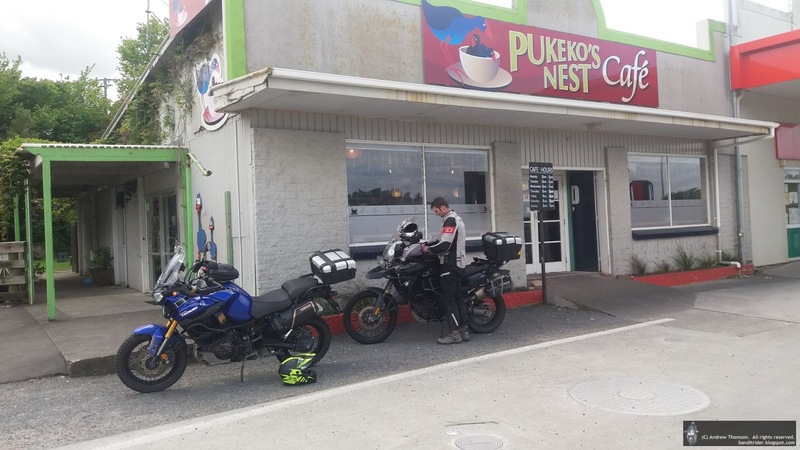 Pukeko - dumb enough to run into the side of a Tenere. Hawks - big, slow, angry and not to be messed with. Often snacking in the middle of the road. 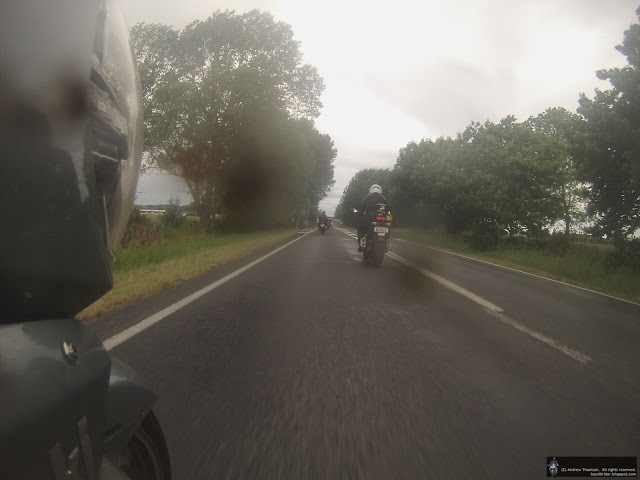 Nearly took one on the handlebars of my GSX400X - would have been exciting. 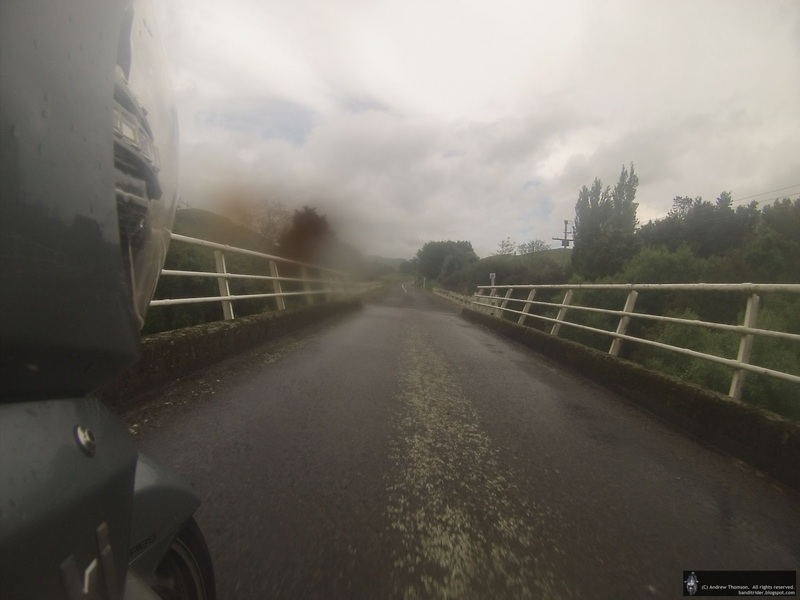 Magpies, seagulls, pheasants - morons that get in the way occasionally. Penguins/kiwi - only seen warning signs so far. Seen wild kiwi on Stewart Island - cool! Cats - quick but dumb. Hedgehogs - slippery, often flat. Dogs - not too bright but man's best friend. Did see a smart lab the other night - he used the pedestrian crossing to get across a busy road (yes, he was taking himself for a walk too). Rabbits - fast, but not as fast as a Connie. Soft. Possums - harder than rabbits. Slow, can be dazzled by lights, make a thumping sort of noise when hit by a Connie mid corner. Goats - quick, agile. Often all over the road but pretty good at getting out of the way. Sheep - dopey, generally have no idea. The smartest ones appear to live on the French Pass road - no fences but they know to get off the road for vehicles. Pigs. Domestic ones are fat and slow but normally stay off the road (they like wet, muddy drains though). Wild ones are small, fast, hard and hard to see at night - would not want to hit one. Deer - fast, scatter brained. Scare Concours riders when they run out in front of them at 2am in the night. Not so bad in daylight - and this is the French Pass Road. Horses - big, solid, dumb and sometimes on the loose on the East Cape. 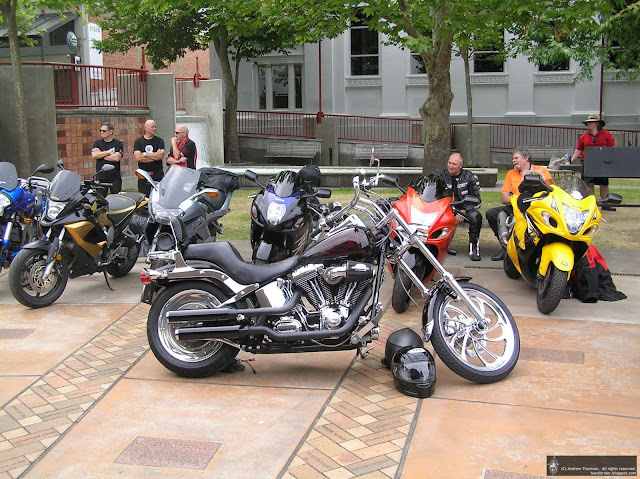 Well it's that time of the year again - Toy Run time. Yesterday was the one organised by the Wanganui Ulysses and I normally try to get over for it. 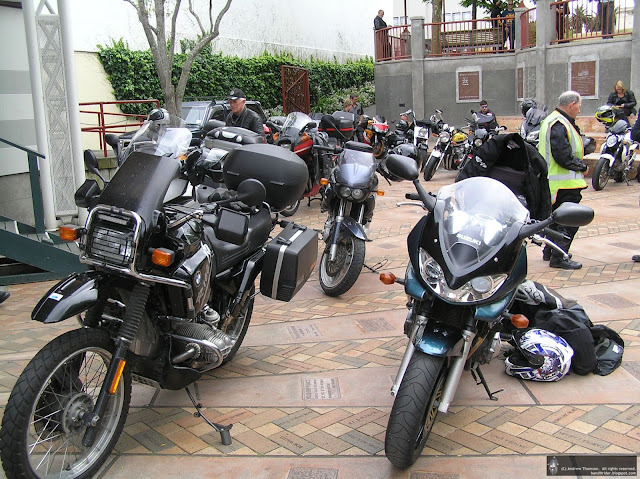 In Wanganui I rode some small bits of the Cemetery Circuit while checking out the bike shops. 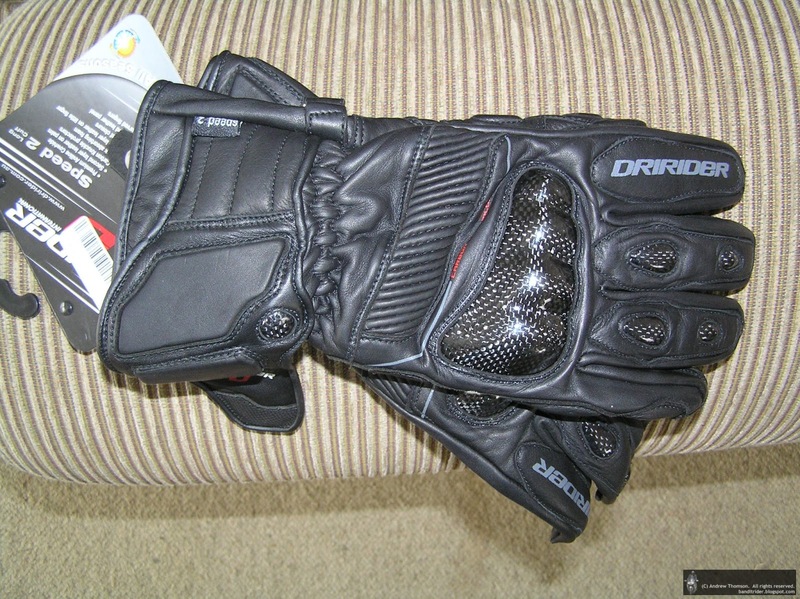 I didn't find a great selection available (still a lot of winter gloves on display) and definitely not in my size - bummer. Parked up it was time to hurry up and wait but bikes were arriving all the time and the organisers reckoned that we ended up with more than last year so that's good for them. Compressor blocking my view of some nice 'busas. (BTW: the three pics above were taken with my ancient little Olympus, still takes nice pics and better than the Fujifilm). At around eleven we mounted up and made our way out of town via the main street and followed the river out of town. The route took in the main road for a while before switching to back roads to Marton and Halcombe. 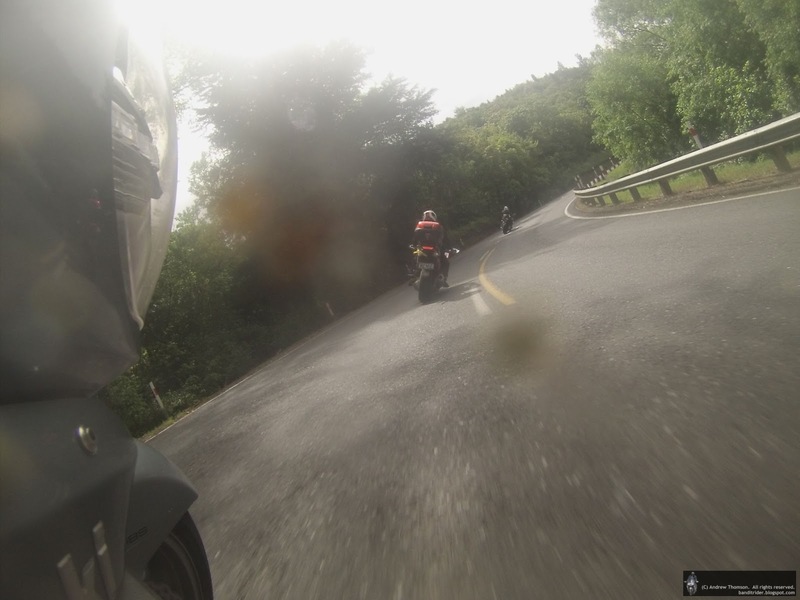 It was very slow and the day was getting warmer by the time we hit Mount Stewart. 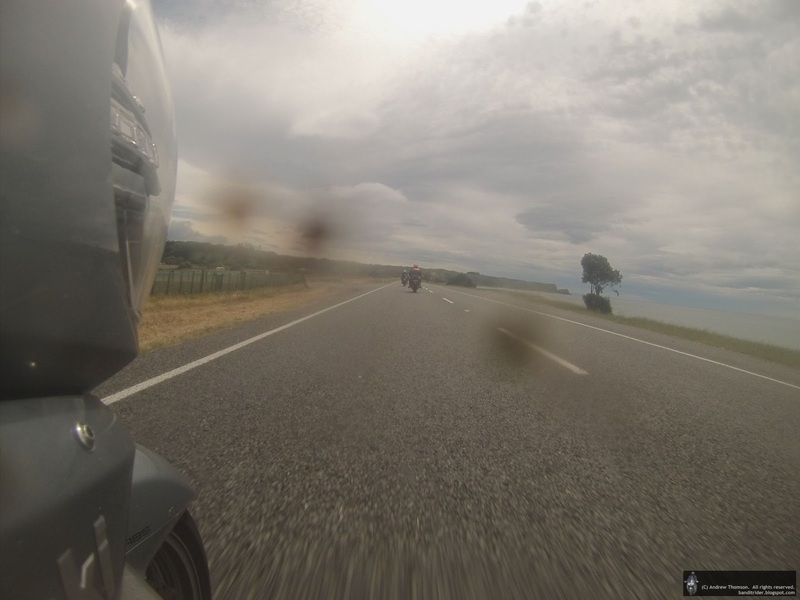 The ride was heading to Himatangi but I didn't really need to go to Himatangi so stuck with it until they were definitely heading further away from Palmy and further towards Himatangi. Breaking away from the group meant that I could pickup a bit more pace and cool off a little. Rather than heading straight home I stopped in at the Honda dealership and managed to find a pair of gloves that hopefully will last me more than 5 minutes. So apparently the silly season is upon us and everyone is supposedly under pressure, tired out and in need of a break. Meanwhile our road toll has already exceeded last year's tally and the remedy is speeding fines for 5km/h over the limit - the same solution as every holiday period for the last few years (thanks Australia). Next up, it was my turn to enter the chaos of the roundabout. Mine was nowhere near as serious as I was never going to ride the poor old Tenere into the side of a truck that decided to not give way to me. I did however come to a complete stop in the middle of the roundabout. Two near misses in less than a minute so now it was time to see what happens when a near miss turns into an event - and this one looked pretty nasty, I hope nobody was injured. I was held up majorly (along with hundreds of others) by an accident on Fitz Ave which is a major road coming into town. 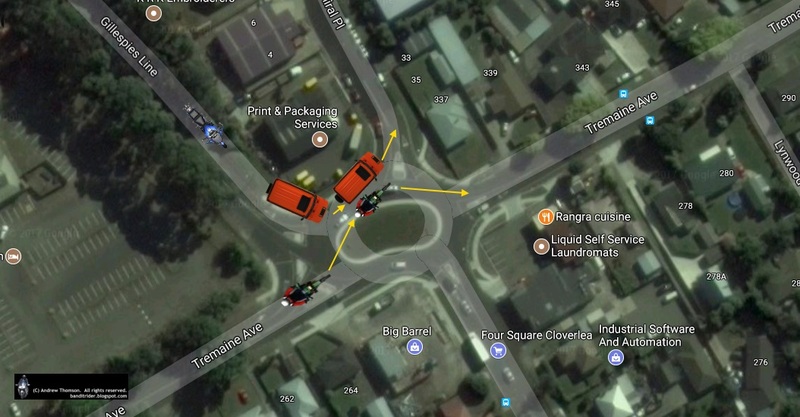 At an (intersection controlled by lights), two cars had come together with quite a whack - the front wheel, axle and suspension had been torn from one of the cars and neither will probably ever turn a wheel again. This is a 50km/h zone. Just after 5pm I was in my car (swapped vehicles, dog in the back) and making my way to the old's when I got held up by the next accident. This time around a bus had taken on a car. To me it looked like the bus had decided to turn out into the traffic (busy road, 2 lanes each way) and managed to tag some poor unfortunate. People everywhere, chaos etc etc. Well, I'm not an expert but I don't see speed as being a factor in any of these near misses/accidents. Maybe one of the cars in accident #1 was getting along but far more likely was that someone was running an orange/red. What I reckon was the cause of all of them was silliness and I don't think you can use the time of year as an excuse. 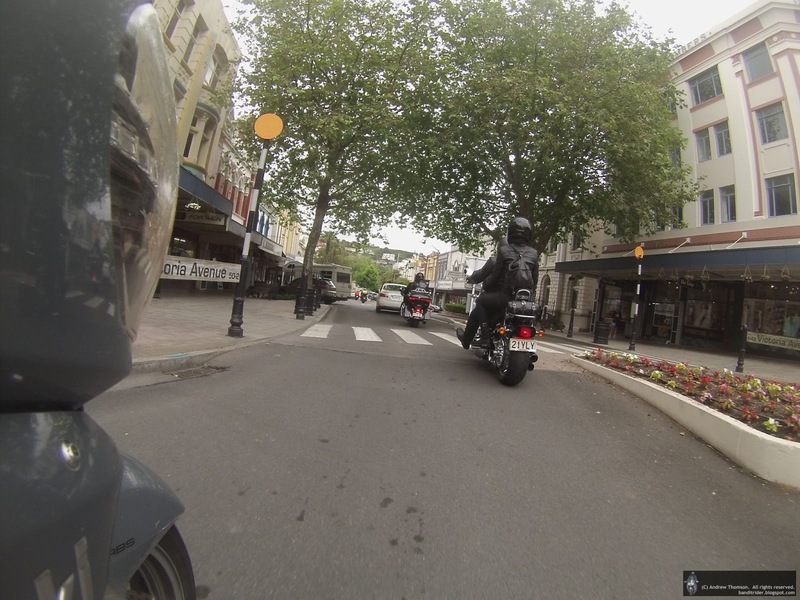 In each case someone decided to ignore road rules or to make a risky decision. Anyway, not the most eloquent rant and I certainly don't have all the ideas to fix stupid but please be careful out there, no silly behaviour, watch out the other loonies, have fun and take care over this silly season! 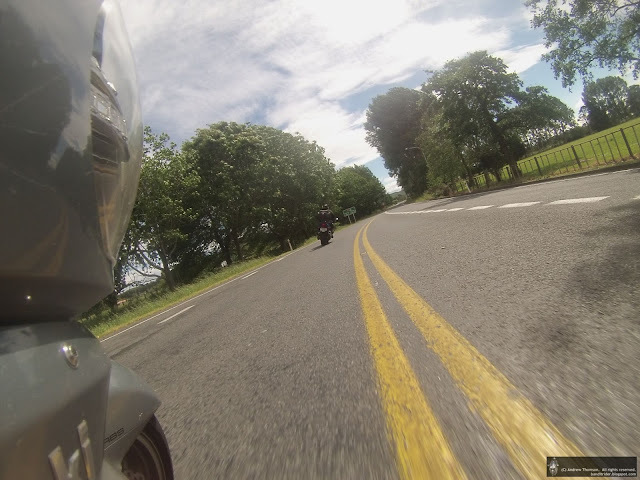 Anyway, enough whinging, I did manage a quick ride today to go out and nab Owl's tag. Who wants a Super Duke when you can have a Super Connie! But first, my current selection. So, I'm sick of the crappy shots from the Fujifilm but still want something small to stick in the tank bag. And I'd still prefer water and shockproof. What to get? Help please! BTW: I can't quite bring myself to potentially kill the little Olympus doing this job. Yesterday I'd been wondering about my next gravel excursion and decided that I wanted to return to the "Badlands" and to also check out another gravel road that I'd only done once, years ago. 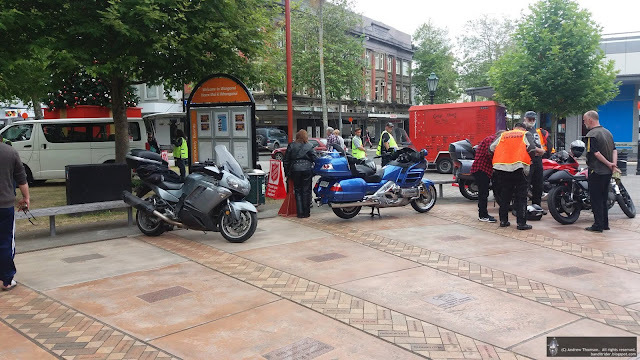 The first bit of our ride was tarmac only across to Wanganui where we stopped for a quick bite before going in search of gravel. 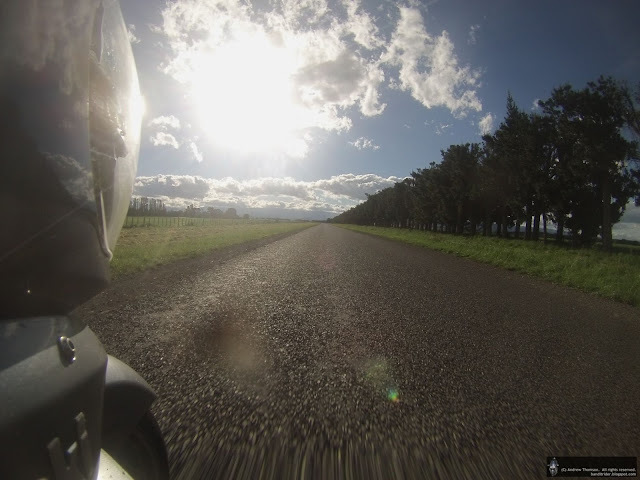 A few kms up the road it was time to turn off the main road and head North on Rangitatau East Road. 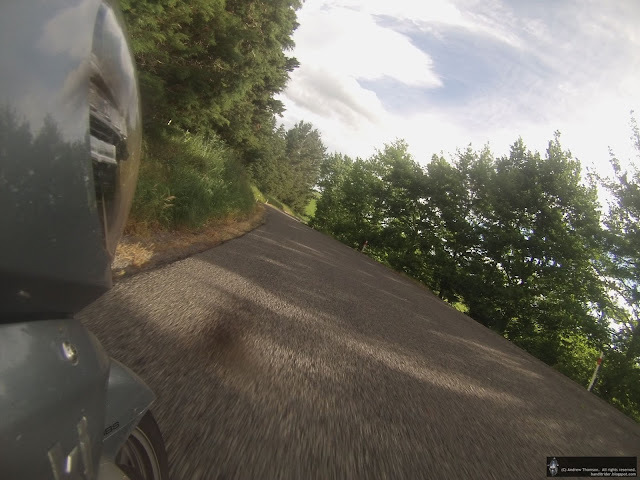 I should had the camera going on the seal as I forgot how nice this road is even while on seal as you wind your way through some very nice bush. Eventually we found the gravel. Look, there it is, I'm standing on it! For a fair chunk of the road the metal was fairly loose so we didn't break any speed limits and just took in the neat road and some nice scenery. 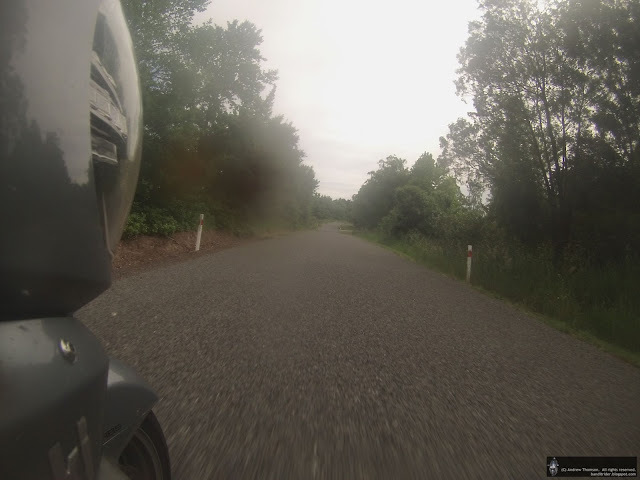 While it wasn't fast riding, it was easy riding with the road in its current condition. A bit of rain would have made things a little different. Approaching the Badlands I was in for a shock, the sign was gone and the place had been cleaned up. 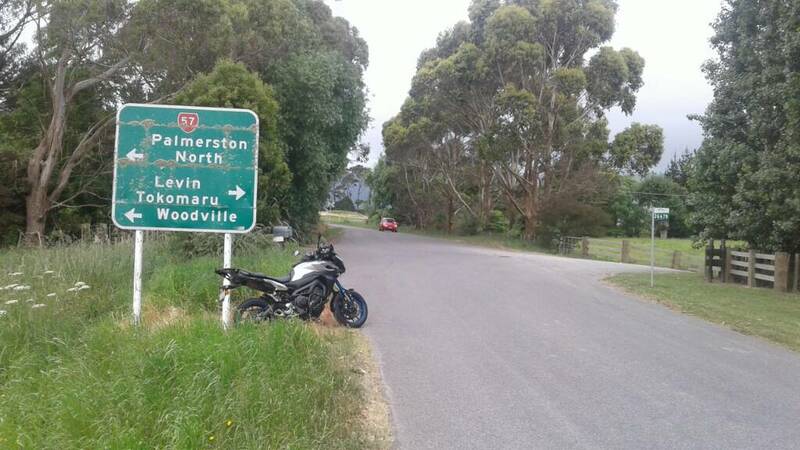 You could see across the paddock to a nice house in a picturesque spot, the only goats in sight were all very much alive and keen to stay away from motorcycles. The last of the gravel opened up a bit and allowed the use of a few more gears but then, as always, it ran out and become a nice windy bit of tar. 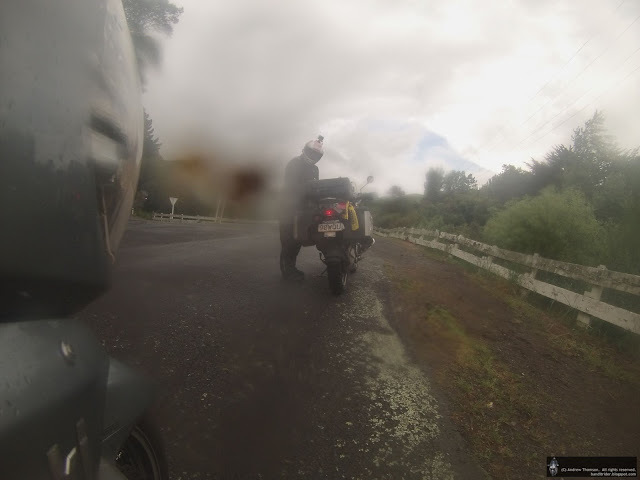 After pulling over to turn the camera off I asked if Rodney wanted to try out the Tenere and after realising that that meant I'd be riding his bike he decided that it was worth the risk. 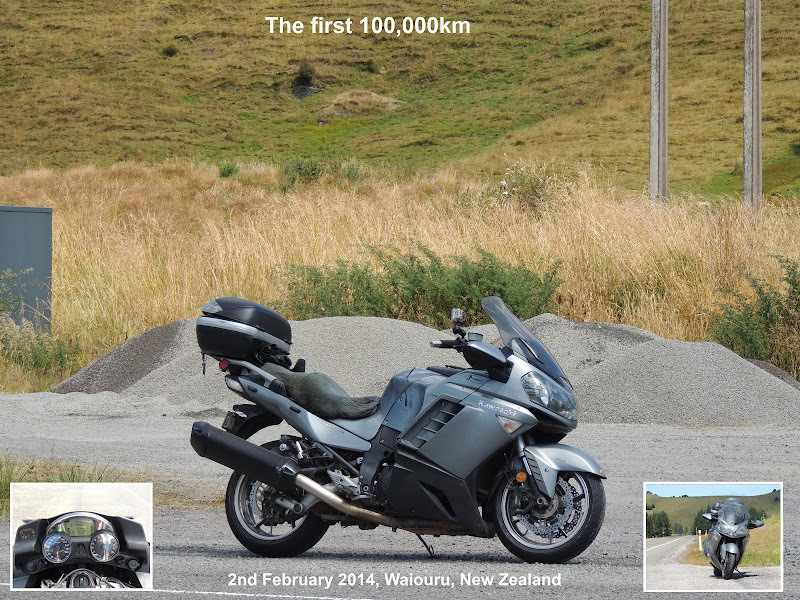 I ended up riding his Beemer through Wanganui and Fordell before finally handing it back to him at the little look-out on Kauangaroa Road. I really enjoyed the little squirt on the Beemer - it's very light and the motor is smooth and willing. 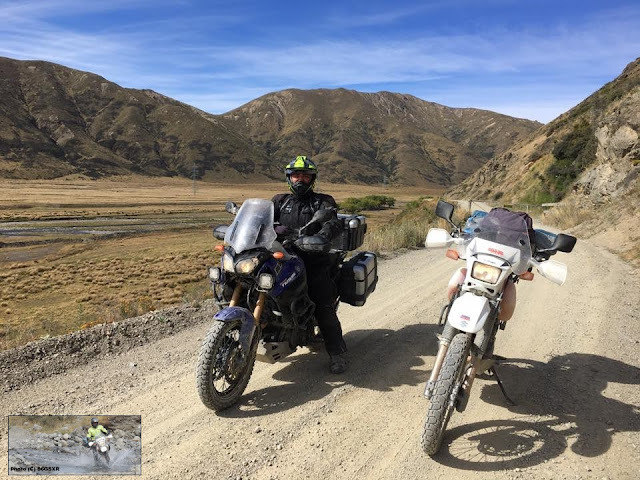 Our next turn-off was onto Turakina Valley road but instead of heading North to Ohakune we went South and took a short (and getting shorter) stretch of gravel over to my next mystery road. 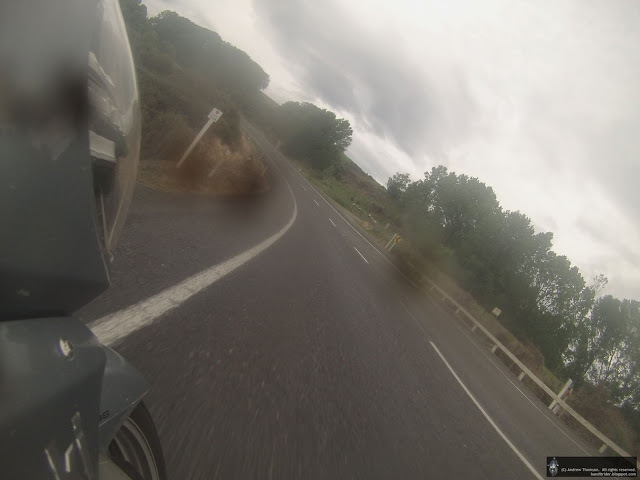 I'd only ridden Taurimu Road once before and that was on a wet day as an Adventure riding noob with the BRR. Back then it had been wet, muddy, slippery and slightly scary. 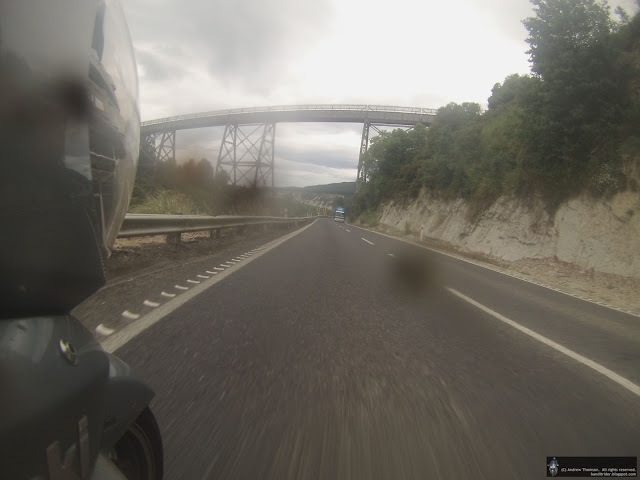 Today it was dry and covered in reasonably deep gravel in places. 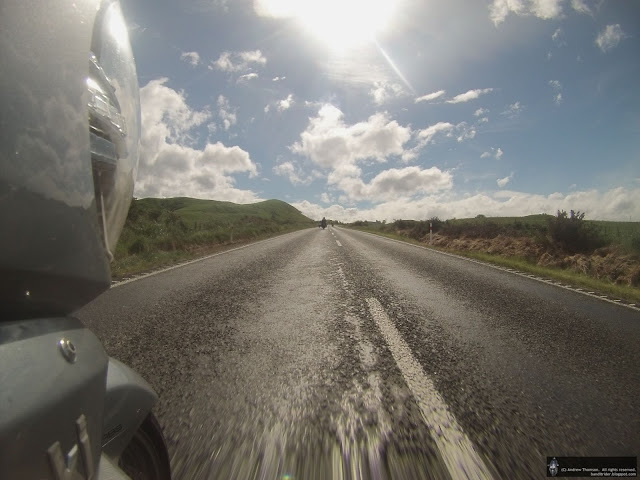 Taurimu Road eventually became Galpins road and then sealed again just north of Marton. But I hadn't finished with my little ride and I took Rodney and another (sealed) deviation just off SH1 just to keep him on his toes. 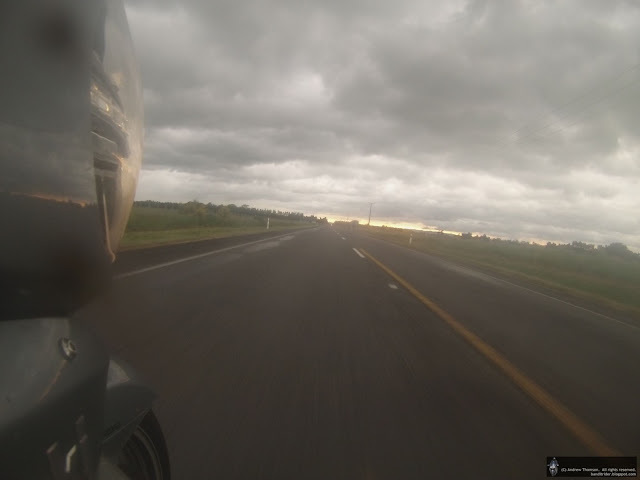 So, I had the GoPro on all day on Saturday with the aim of getting a heap of photos and stitching them all together for a time-lapse of the day's outing. 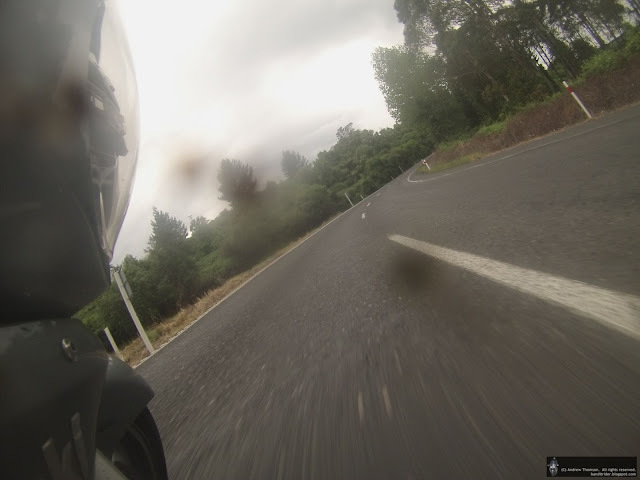 But I fouled things up in Wairoa by somehow starting the camera in video mode. And then in Dannevirke the camera gave up - not sure what happened there. Well, if he wasn't famous before he is now...Dar has shown him off to the world via her piece on Farkle Garage. Neat! (Skip to about 5:30 if you can't wait to see him). Well, I can quite confidently tell you that there is nothing on TV at that time of the night so I ended up being ready to rock pretty quickly and was first to the gas station where we were meeting. Not long after I arrived Yod turned up, followed by Meanie and Monie and then Rodney keen for his first NZDR ride. With the weather actually better than forecast (no rain, not cold), we headed South with Menie showing the way. In places the road was wet but there was just the odd spit. 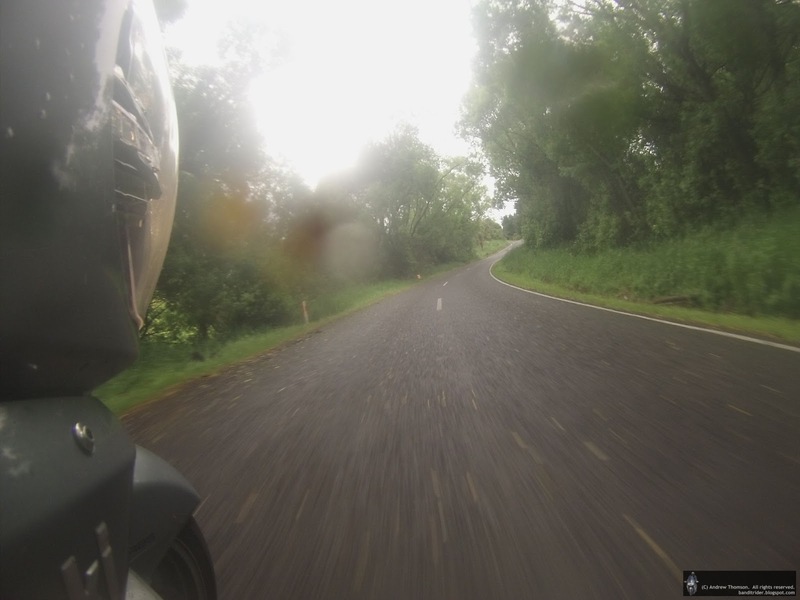 The trip over the Paikok hill got a little exciting for me a couple of times when I hit something that threw the bike a bit sideways before she shook her head and carried on. 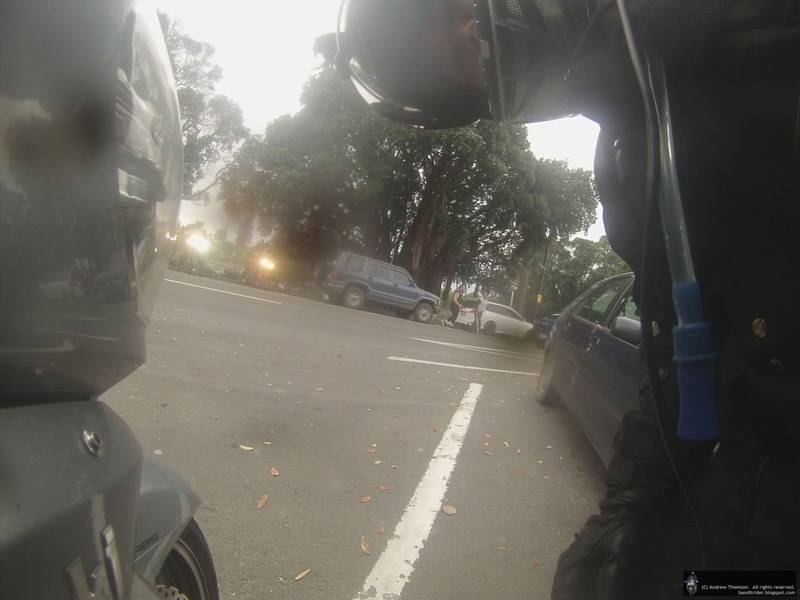 Then the idiot rider managed to hit a rock just two corners up the road. I gave myself a bit of a slapping, dropped back from Monie a bit and settled down. In the Hutt we were at the ride start for just long enough to sign on and clean visors before taking off again. 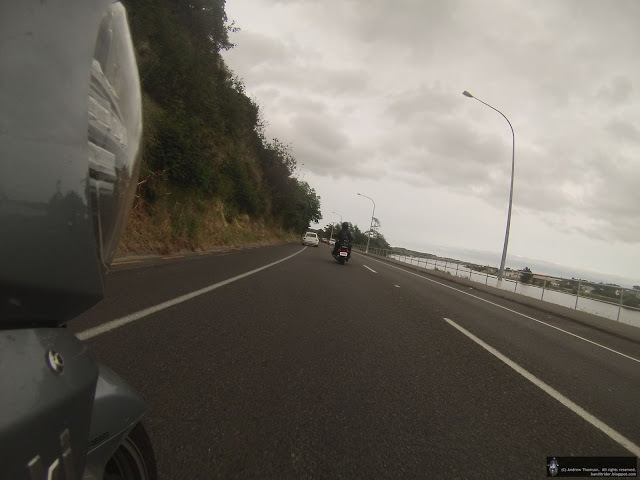 The Rimutakas were a little damp but relatively traffic free with just one unplanned stop at some roadworks. Off towards the East there was hopeful colour in the sky so we kept the bikes pointed that way. We got a few showers and were on mostly on wet roads as we made our way up to Pahiatua where we stopped early for fuel. 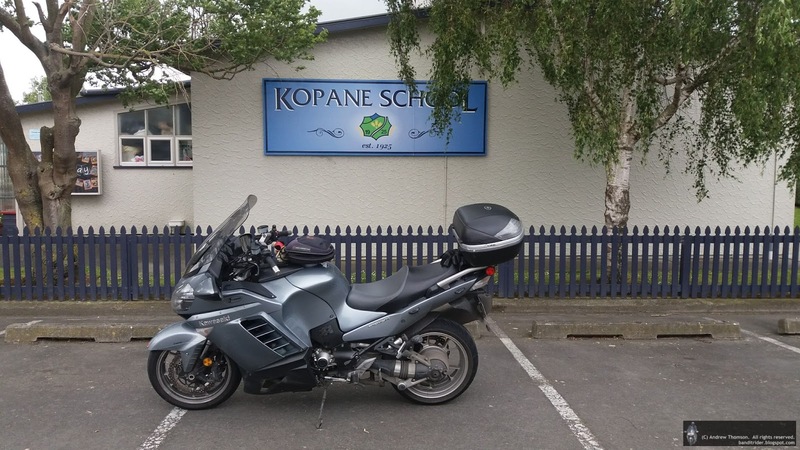 I'd planned out our fuel stops out with the first being in Dannevirke but two of the crew had been a little doubtful at the 307km first leg so I decided on the earlier stop - as it happened they would have made it easy. 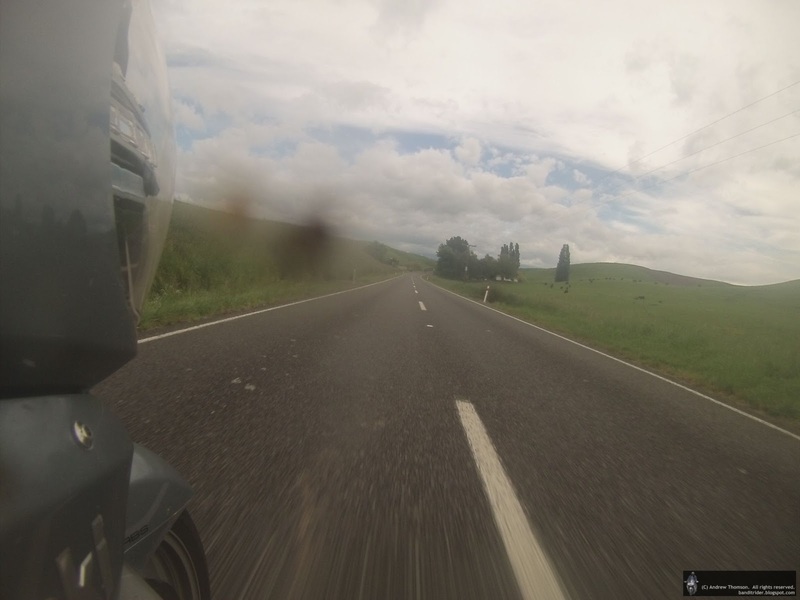 Just before Dannevirke we turned off again and got onto the Weber road. 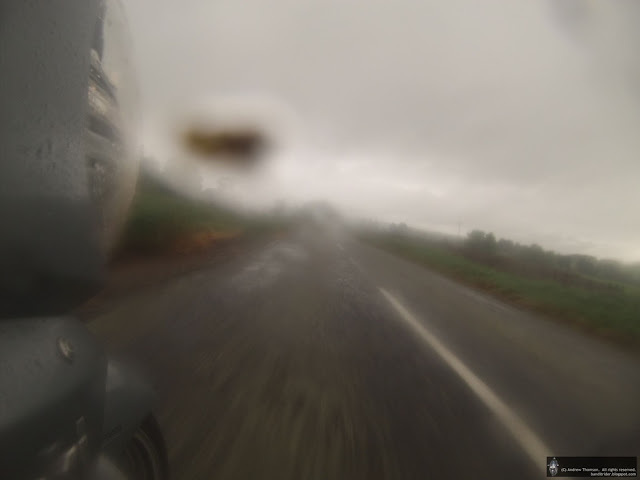 Conditions ensured that our wet-weather riding skills didn't go wasted. Not far up the Weber road we turned Northwards to our first photo checkpoint on the Ormonville - Te Uri roads intersection. 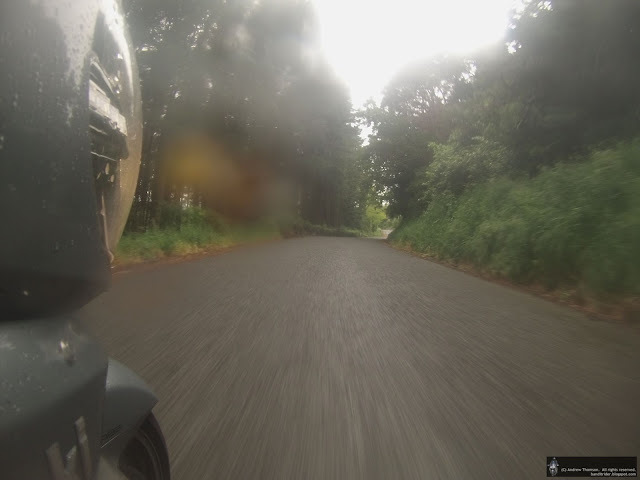 This involved riding a few nice windy back roads in slippery conditions - still fun and there was some nice scenery (when you could see) in places too. From the checkpoint we carried on across more back roads to Takapau where the rain finally gave up the chase and let the sun take over. The next checkpoint was in Waipawa. 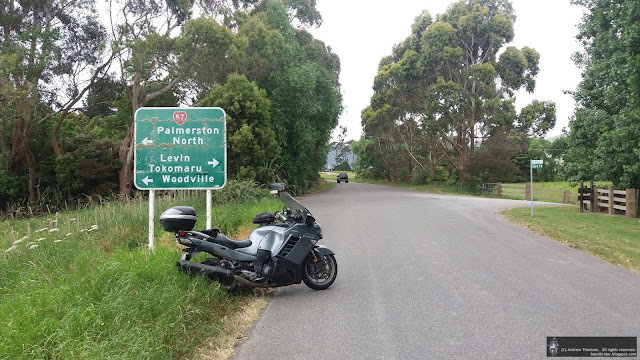 The next check point was supposed to be a sign saying "Somersby" and I had used the street address we'd been given as the waypoint in my GPS route. 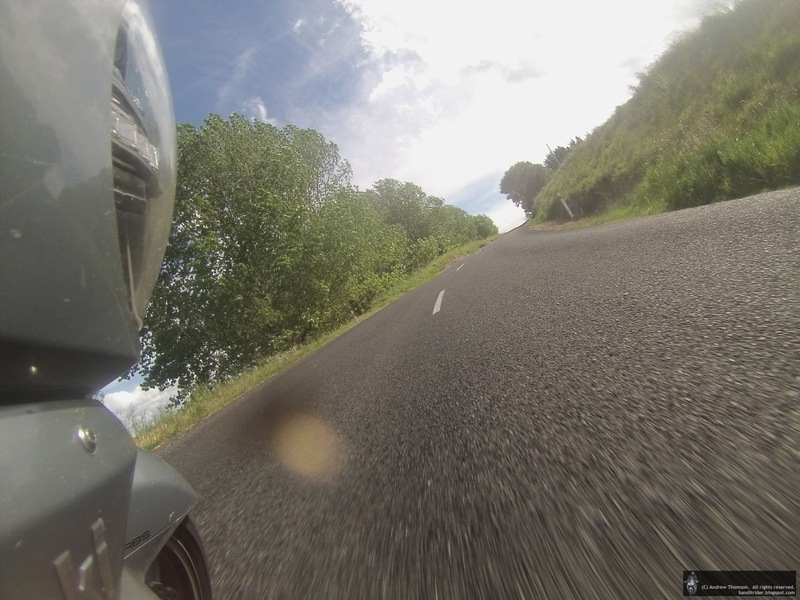 It turns out that the Garmin maps are not that accurate in the back roads of Hawkes Bay. We had a brief chat on the road and carried on a bit looking for the sign but to no avail. In the end we stopped at the entrance to a couple of properties, took some pics, lost some warm layers and took on water - things were hotting up. We eventually found SH50 and carried on up (waving to KoroJ along the way) to busy Napier and then Bayview where it was time for another early fuel stop. Just out of Wairoa we decided to stop for lunch at a little cafe by the river. Unfortunately there was a 45 minute wait and that's not really ideal when you've 1,000km to do so we carried on into Wairoa and had a great lunch at the bakery. Don't fiddle with the camera! About 60km in was our checkpoint. 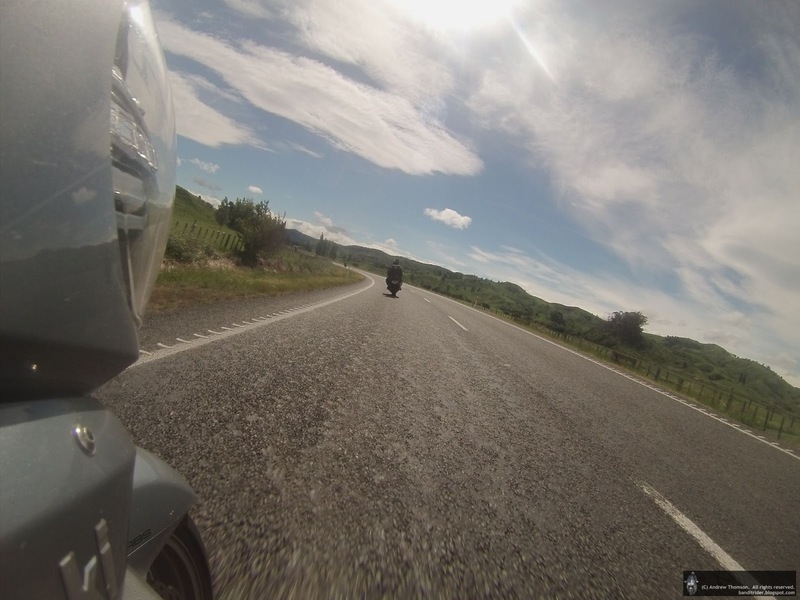 Now it was time to turn around and head back to Wairoa. I initially behaved myself and sat behind Monie but she got sick of me and shooed me away. 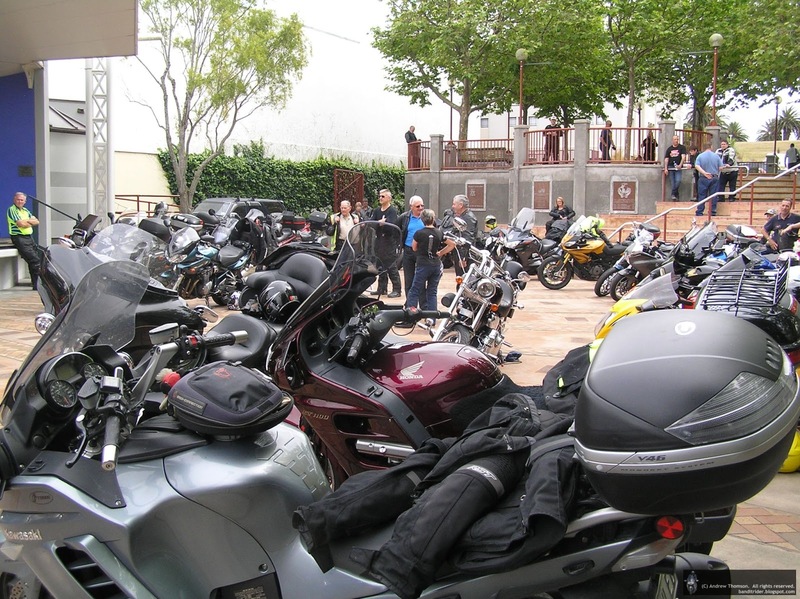 In Wairoa we stopped for gas and a cold drink before attacking the Napier-Wairoa road once more. Getting to our next checkpoint meant ducking up the Napier-Taupo road and then turning off onto Glengarry Road to go in search of some letter boxes. Now, this was one checkpoint I was a little worried about so had used GoogleMaps to locate it and then get the co-ordinates - and this time it worked! 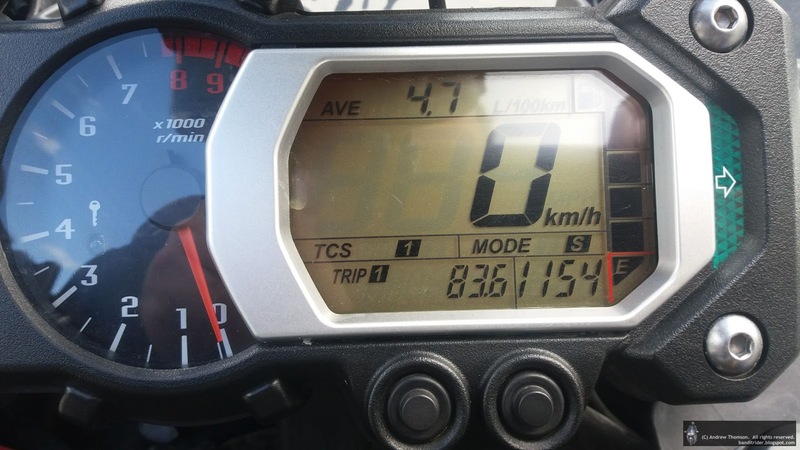 By now we were over the 800km mark and this was the last checkpoint. But, we hadn't found that fourth one and after asking the troops we decided it was worth another looksee on our way home down SH50. 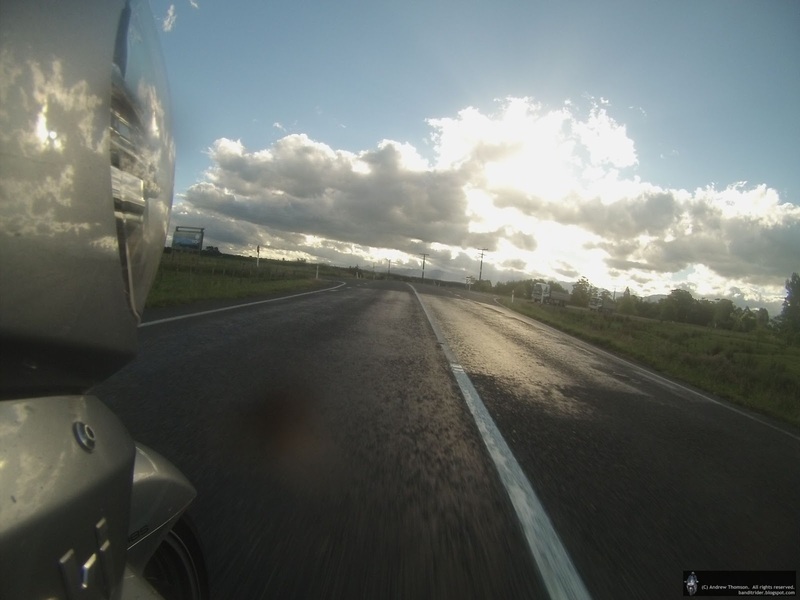 Now it was time to abandon the route map and hit home on the GPS. 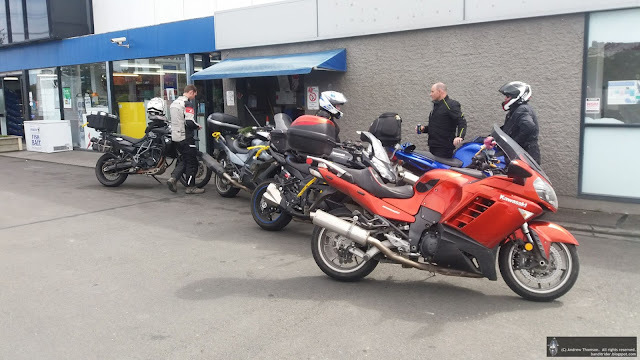 It turned out that the GPS sent us back past CP3 as well before getting us back onto SH50 and then SH2 to Dannevirke where it was time for one last stop for a cold drink.